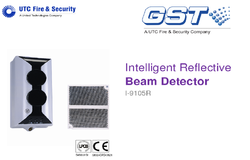 I-9105R Intelligent Reflective Beam Detector works on the principle of reflective infrared beam smoke detector that can be directly connected to a fire alarm loop. Transmitting status information via the loop between the detector and controller. The detector must be used together with a reflector. The number of reflector(s) to be used (one or four) depends on the distance from the detector. 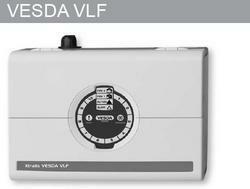 Built-in intelligent microprocessor, the detector has strong ability of analysis and judgment. The detector automatically carries out system adjustment, compensation and variation of ambient data. Secure and speedy communication through the on board processor enables the detector to make its own decision, resulting in greater automation. The sensor and the panels utilized fuzzy logic providing an almost limitless cause and effect scenarios. The detector is ideally suited to historical buildings, warehouses,large storages, shopping malls, leisure centres, exhibition halls, , printing houses, clothing factories, museums and prisons, as well as places where slight smoke particles or corrosive gas exist. Simple and cost effective to install transmitter and reflective via ‘honey comb’ mirror. Quick and easy to set up, visual strength indication. Automatic compensation for factors weakening received signals, such as dust contamination, positional movement and ageing of the transmitter. Two selectable levels of sensitivity adjustment. Fire Detection Systems offered comprises smoke alarm and optical sensor system to provide timely detection of smoke and fire. Finding use in residential buildings, offices and other commercial places, these fire detection systems feature test button with LED indicators as well as 9V Battery with low battery signal for delivering continuous performance. Some of its features include operating voltage of DC 9V battery, alarm sound of ≥85dB, ambient temperature of -10°C-+60°C, optical sensor support, red and green led based light source, developed in fire-retardant ABS plastic material. Voltage 6 - 26 V.D.C. 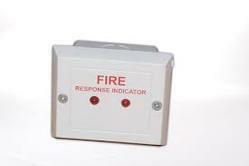 Response Indicators are connected to automatic fire detectors in order to indicate quickly the source of an alarm signal from detectors which are not easily accessible or visible. Photoelectric Smoke Detector with Battery Back-Up offeredcomprises SMD-30 with operating voltage of DC9V and sound output of 85 Db at 10 feet. Further, the 9V battery support provides backup for at least 1 year. 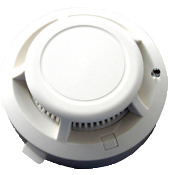 Coming with protection area of 6 m high, the smoke detector also provides for superior working stability. Some of its features include advanced sensor support, support of 9v battery for independent working, high sensitivity support, operating temperatures of -10 degree to 50 degree, alarm volume of 85dB/10 feet, can be provided with support of sound and flash light alarm, ceiling mounted installation among others. Sound Output : 85 Db at 10 feet. Protection area : 6 m high. 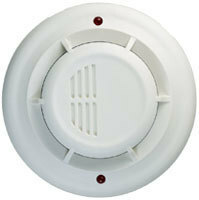 4 Wire Photoelectric Smoke Detector offered comes with ceiling mounted finish and works on wired network output support. The smoke detector also comes with NC/NO alarm output support as well as LED indicator and low battery warning so as to provide for consistently reliable performance. Some of its features include self-test button, power support of DC12V/DC24V, anti-fire ABS housing, resist false alarm efficiently, relay output to connect remote panel, dustproof anti-light designs, provides for 360·visual support, ceiling mounted option and others. Installation Mounting dimension is shown in Fig. 2. 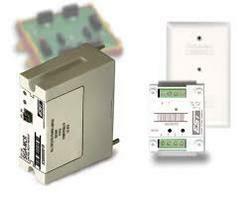 If the relay is used to resist interference, it should be installed outside the area suffering from the interference. For example, it can be installed inside the FACP. If it’s used to lengthen communication distance, it should be installed where the distance to the FACP is not longer than 1000m. It should be indoor-installed using M4 screws. Non-volatile memory Permanently stores serial number, type of device, and job number. Automatically updates historic information including hours of operation, last maintenance date, number of alarm sand troubles, and time and date of last alarm. Automatic device mapping . Each module transmits wiring information to the loop controller regarding its location with respect to other devices on the circuit. Permanently stores programmable address; there are no switches or dials to set. Addresses are downloaded from a PC, or the SIGA-PRO Signature Program/Service Tool. All decisions are made at the module allowing lower communication speed while substantially improving control panel response time. Less sensitive to line noise and circuit wiring properties; twisted or shielded wire is not required. Ground fault detection by address Detects ground faults right down to the device level. Designed for high ambient temperature operation Install in ambient temperatures up to 120oF (49oC). Looking for Fire Alarm System ?